MELBOURNE, Australia — Novak Djokovic was so good, so relentless, so pretty much perfect, that Rafael Nadal never stood a chance. 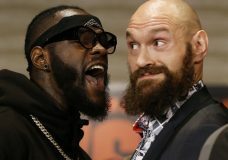 LOS ANGELES — Deontay Wilder has waited a decade for the chance to pick on somebody his own size. 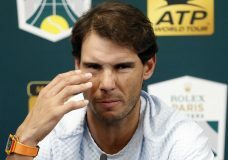 LONDON — Rafael Nadal pulled out of the season-ending ATP Finals because of an abdominal injury and had surgery on his right ankle Monday. PARIS — Rafael Nadal pulled out of his second-round match at the Paris Masters on Wednesday because of an abdominal problem, meaning Novak Djokovic will reclaim the No. 1 ranking. NEWTOWN SQUARE, Pa. — Tiger Woods endorsed Nike’s latest “Just Do It” ad narrated by Colin Kaepernick with a message nearly as succinct. “It’s a beautiful spot ,” Woods said. 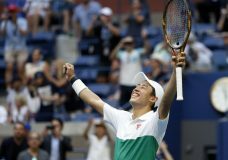 NEW YORK — Kei Nishikori rallied to outlast Marin Cilic on Wednesday at the U.S. Open, giving Japan a men’s and women’s semifinalist at the same Grand Slam for the first time, according to the ATP Tour. 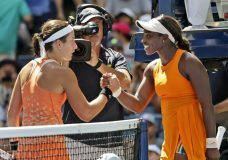 NEW YORK — Defending champion Sloane Stephens was eliminated Tuesday from the U.S. Open, beaten by Anastasija Sevastova 6-2, 6-3 in the quarterfinals. NEW YORK — Serena Williams’ yells of “Come on!” crescendoed right along with the tension in a fourth-round U.S. Open match that began as a rout and suddenly became riveting. Rafael Nadal is back in the U.S. Open quarterfinals after beating Nikoloz Basilashvili 6-3, 6-3, 6-7 (6), 6-4.